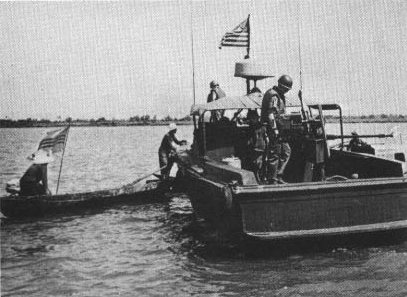 River patrol boat on the Mekong Delta. Photo from the U.S. Navy All Hands magazine November 1968. After dinner, Má decides who’s coming to the countryside in the morning. I try to go whenever I can. I’d rather swim and fish all day than stay on our crowded island. Around eight the next morning, my three older sisters and I carry baskets down the wood dock to our boat. I ask to carry the basket with food. I worry someone will forget to bring the rice. The neighborhood is already awake. Usually, we wake up at four in the morning, and the only noise is our bare feet hitting the wood dock when we leave. “The land doesn’t wait. Fruit doesn’t wait. Nothing waits,” Má says. But today we had to wait for the tide before we could go. It’s almost slack tide now, when the water stills before it changes directions. 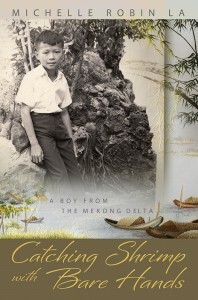 We have an hour to travel down the Mekong with no current. By the time we get to our farm, the tide will be coming in. We’ll follow the rising water as it pushes up the small stream that leads to our land. It’s hard to talk over the loud rồ rồ rồ of the motor. I stick my hands in the muddy water running along the side of the boat. Má turns the propeller to avoid tangling it in clumps of purple water hyacinth floating by. We stay close to Tân Long Island to avoid the blue and red fishing ships on their way to the ocean. Boats tied to posts and docks line a shore crowded with tin and water coconut leaf roofs. Across the river the city of Mỹ Tho is even more crowded. In my mind, I chart the course down the Mekong from the island we live on to the island where we farm, wondering how much the land has changed since my last trip. When we get down to the end of the island, we’ll cross over to the Mỹ Tho side of the river, the safe side. We usually don’t travel along the other side. Má says that’s the Việt Cộng’s side. If you get too close, a Việt Cộng soldier might force you to transport something for them. I try to look toward the tail end of our island, but it’s hidden behind wooden freighters anchored near shore. 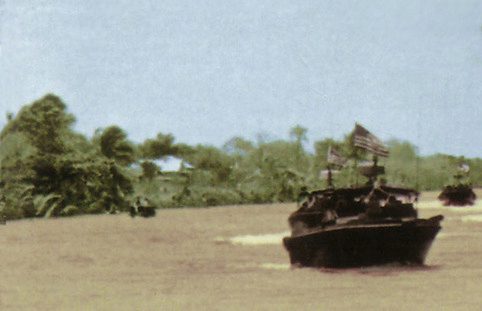 As Má pulls around a freighter, we see American river patrol boats sitting off the end of the island. They’re stopping boats going into and out of the city. “I hope they don’t stop us,” Má says. I see river patrols all the time, but I’ve only been in our boat once when it was stopped. We were coming home from the farm and the boat was full of fruit. The soldiers went through all of the baskets looking for anything suspicious: antibiotics, extra supplies, guns, or even a hiding Việt Cộng. It took them so long that the tide changed, and we had to go against it the rest of the way. I was so hungry when we finally got home. River Patrol Boat stops a small Vietnamese boat. Photo from the U.S. Navy All Hands magazine July 1969. 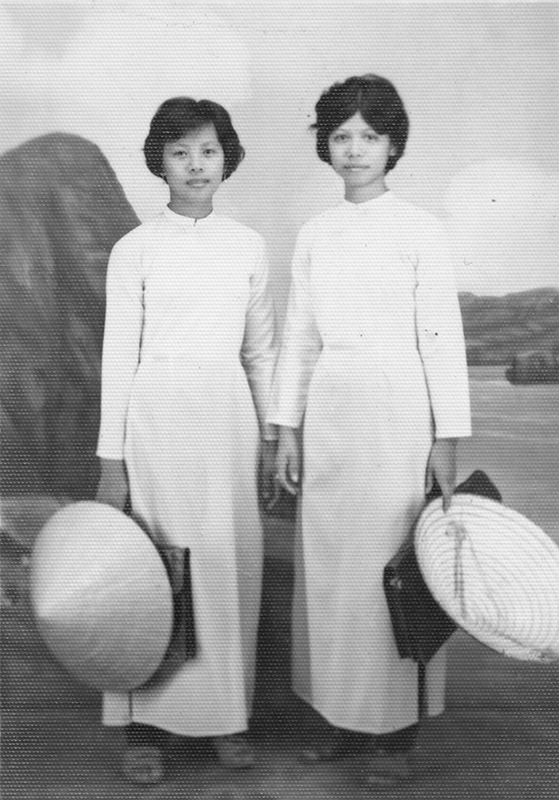 “We’re going to Cồn Tàu to work our land,” Má says. Chị Ba and Chị Hai wearing school clothes–white traditional long dresses with pants (áo dài). “Hello,” my sisters say. They say something else I don’t understand. I wish I could speak English. The translator tries to explain, but the American keeps talking. Three more American soldiers come out and start talking and laughing. Some of them wear pants but no shirt, and some have a T-shirt and Army shorts. They’re all barefoot. When they smile and laugh they seem like everyone else. They’re not scary. I like them. They’re keeping us safe. My sisters say a few more words, then stop talking. The Vietnamese translator encourages them to say more. The soldiers smile at them. I want to hear them talk more, too. The soldiers all talk at once and laugh. My sisters get quiet. They look down at the boat and then glance back up at the men. “Come closer,” the translator says. We wave goodbye. They didn’t check anything. My sister hands me an apple. Má starts the motor again, and we head across the river toward the safe side. Read the rest of the story in Catching Shrimp with Bare Hands: A Boy from the Mekong Delta. ← What Is a Cheap Tree?